FMEAs for Monitoring and System Response, or FMEA-MSRs, supplement DFMEAs and consider how systems can fail while being used by the customer. 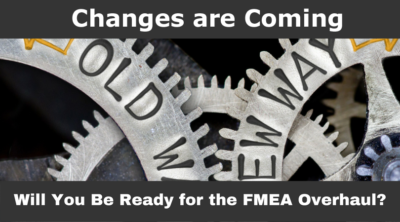 FMEA-MSRs are being introduced in the new 2018 AIAG-VDA FMEA Handbook. Here is a short Q&A about what an FMEA-MSR is. An FMEA-MSR is intended to help maintain a safe state (i.e. safety) or state of regulatory (i.e. environmental) compliance during customer operation. FMEA-MSRs analyze potential failures that may occur under normal operating conditions and their corresponding effect on the system. A significant focus of the analysis is to determine if the system or the end user will detect a failure if one does occur. 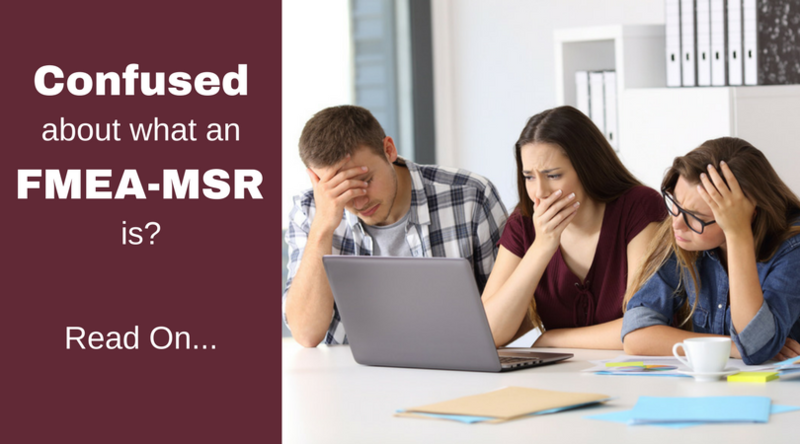 Why is an FMEA-MSR needed? FMEA-MSRs have been introduced to ensure safety goals (as required by ISO 26262) have been fully considered and are meet. ISO 26262 defines functional safety for (automotive) equipment that applies to the lifecycle of electronic and electrical safety-related systems. An FMEA-MSR basically incorporates Functional Safety Concepts and ASILs (Automotive Safety Integrity Levels, an automotive-specific risk-based classification of safety goals) to the analysis of the design. While ISO 26262 is an automotive industry standard, introducing functional safety concepts to an FMEA study is a good idea for any industry segment. When is an FMEA-MSR used? An FMEA-MSR is most often used a supplement to a DFMEA. It is often useful to define the scope to be studied in conjunction with the customer. How is an FMEA-MSR conducted? The study uses the same 6-step process presented in the 2018 AIAG-VDA Handbook for DFMEAs and PFMEAs.